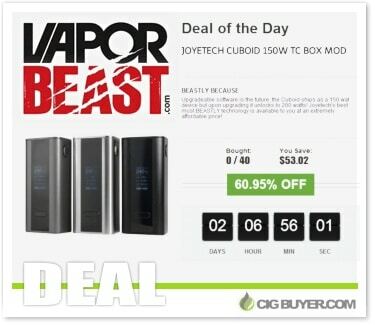 Joyetech Cuboid 150W Mod “Deal Of Day” – ONLY $30.57! Last year the Joyetech Cuboid Mod was one of the hottest devices on the market. Although it’s being replaced by the Joyetech Cuboid Tap, the original is just as relevant today and offers the same clean aesthetics with all of the advanced features vapers have come to expect. Powered by dual 18650 batteries, it provides up to 150W of output (upgradeable to 200W) with precision temperature control (Ni/Ti/SS/TCR) and features a large 0.96″ OLED screen, flip open battery cover, oversized firing button and more.